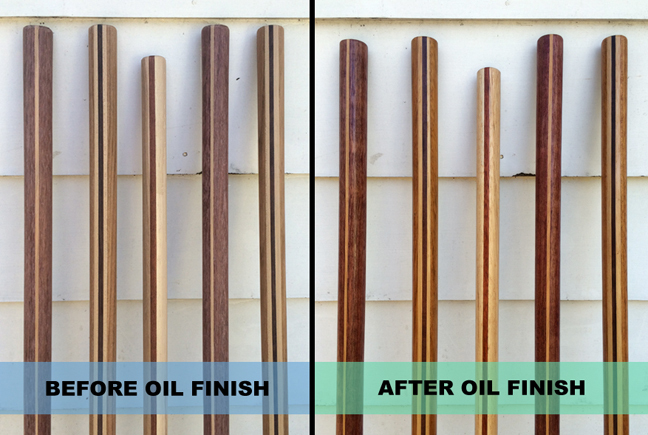 I love applying the first coat of oil and seeing the wood come to life. I spent lots of time yesterday finishing up a few Christmas orders – very satisfying work. Projects included a pair of special order Chizikunbo and the cutting down and refurbishing of an old bo. In the case of the bo, a father is giving it to his daughter and it feels great to help pass along our passion to a new generation. I added a little “Adam” touch that he hasn’t seen yet, but I know he’s going to like. Merry Christmas everyone, and happy New Year. Three p rojects in front of me. After some months, I am finally getting to the finishing stages on my second reverse-taper bo. This one (far left) is made from two pieces of blood wood laminated together. The wood is heavy and dense and should make for a beautiful weapon. Once oiled it will be a deep dark reddish color as the wood’s name suggests. The other two bo have been in a student’s closet, or garage, or attic, for longer than anyone can remember. The goal is to see if there is still life in these “old timers.” Once I get them scraped, sanded and oiled, I will know if they re useable as is. And, if they aren’t, I may cut them down to start life over as shorter weapons. 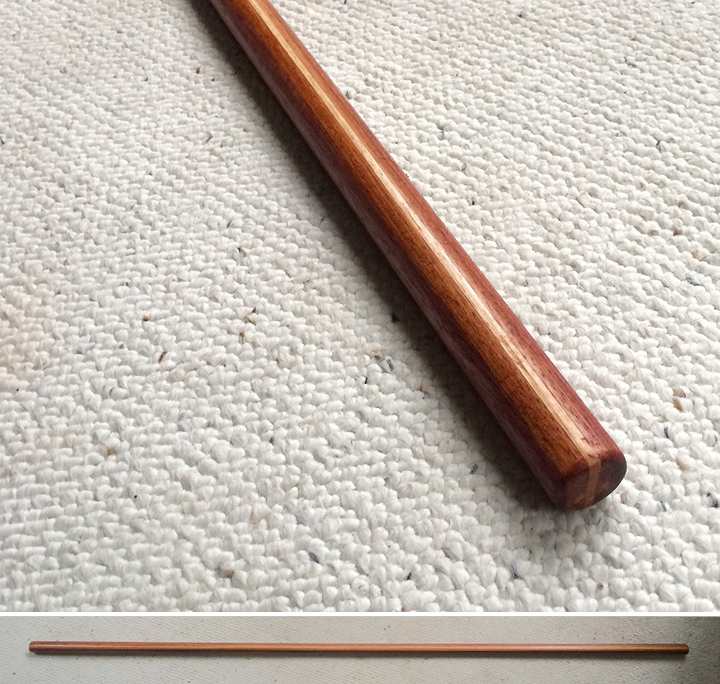 I made this bokken some years ago as a gift for my sensei. He was recently finding that the tsuka (handle) was not feeling quite right in his hand so I spent time this past weekend reshaping the piece. 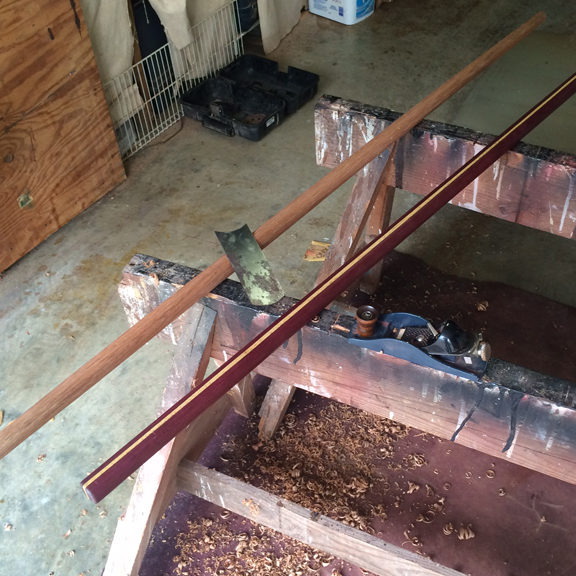 This bokken is a combination of purple heart and hickory and one of my favorites. It has been nice to have it back for a visit. 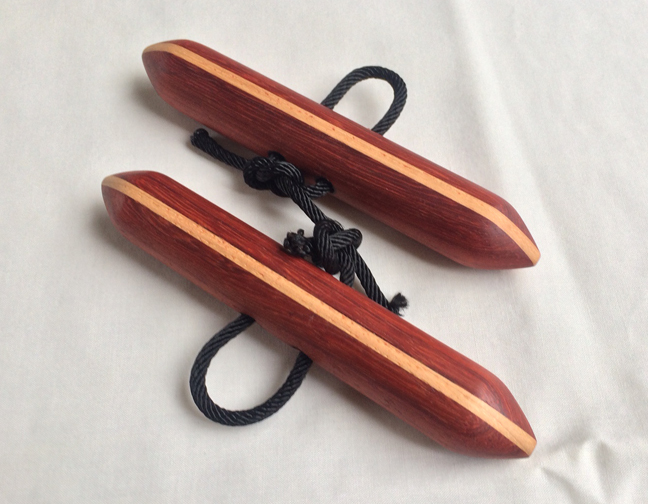 Most of those who study kobudo are familiar with two types of bo; straight and tapered. In the former, an even diameter from end to end leads to a sturdy, relatively heavy weapon. In the latter, the diameter tapers down from the center towards each end. This removes weight without compromising strength. A tapered bo tends to allow for easier, faster manipulation. But less commonly seen is a reverse-taper bo such as one below that I just completed for a client. In this case, the end diameters are larger than that of the center. I had not used one prior to making this one but took some time to “test” it before shipping it out. The feel is quite different. First, although it behaves like a straight bo, the weight is closer to that of a tapered version. In addition, with the weight balanced towards the ends, it creates it’s own momentum on spins. And, the extra diameter at the ends allows for great control when both hands are at one end (such as with pokes). All in all, this is a unique alternative and I look forward to making more.